Yesterday was, without a doubt, one of the saddest days in the contemporary history of Venezuela. 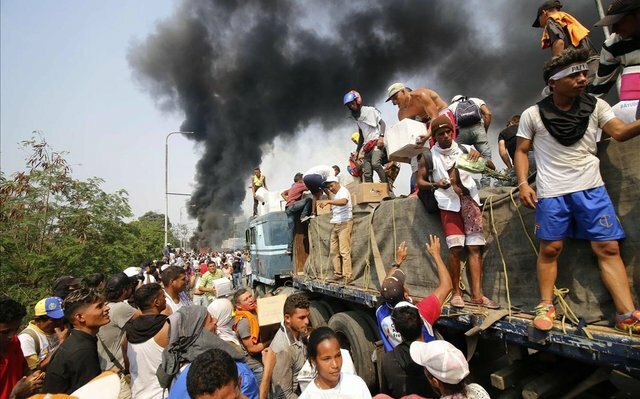 The humanitarian aid that our people so badly needed was attacked and even part inceived, so that it did not pass into Venezuelan territory. To the world's surprise, the dictator Nicolas Maduro and his followers celebrated such a nonsensical victory, in the most cruel and indolent way, without realizing that, on the contrary, what they did was to accelerate the course of events. There are no doubts left before the international community of who is who in Venezuela. No more masks. I feel that now, the support from abroad is going to be more forceful than ever. They could already realize, live and direct, why Venezuelans, for more struggle that we have given, we have not been able to remove those powerless from power. I think that the case of Venezuela will give rise to many reflections on the importance of international organizations and multilateral support in defending the rule of law and democracy of any sister country. Because although, certainly, the easiest way to gain access to power is through elections, it will no longer be the case, to bolt on it and, from there, steal, impoverish and mistreat the population. Venezuela will show that this will no longer be the case, since excusing oneself from the principle of the self-determination of the peoples will not be enough to maintain and justify a dictatorial government anywhere. No more dictators of the 21st century. If Maduro's idea yesterday was to demoralize the Venezuelan people, he has made a mistake. We know that sooner or later, freedom and prosperity will return to our country. Everything changes every day, and I certainly think that we have never before been in such a favorable scenario for the rescue of democracy. The situation, difficult as it may seem, has only strengthened the struggle of the Venezuelans, the love for our country and our civic conscience. The country that claims us needs us well prepared, as well as strong, as human. With the pain for the suffering of so many people who have lost relatives, who have been mistreated, wounded and vexed, I applaud the courage of our compatriots who threw their fear behind us and have shown why we are called Bolívar's children. We will also be eternally grateful to all the people who from different latitudes support us in this hard test that we have had to live. We know that the end of this nightmare is very close. We are anxious, certainly, the problems are many, but hopeful that, as never before, there is light at the end of the night. Times of hardship have a way of bringing the worst and the best out in people. You will know your true friends that will aide in the journey through this dark time. So is. Thanks for reading me. Thank you. I try to live in this country of ups and downs and uncertainty. Greetings. Here's a free vote, just for being you!! Have an amazing day!! Keep writing! Know that there are many prying for you! Count me among them. Of course! Thanks for reading me. Hello @marynet! This is a friendly reminder that you have 3000 Partiko Points unclaimed in your Partiko account!